Officially, the citizenry of the city of Krakow is is put at some 760,000 but the figure leaves out thousands of actual residents who don't bother to register as such, illegal immigrants, and about 100,000 students with permanent homes elsewhere. At the same time the population of entire metropolitan area, i.e. the Krakow proper together with its outer suburbs and satellite towns, totals some 1.5 million people. And the headcount within the 100-kilometer (62-mile) radius approaches nine million. The city’s residents are solidly Polish. Nevertheless several thousand foreigners live more or less permanently here. In Poland the denizens of Krakow enjoy a reputation of meticulous and frugal folk, a bit reserved but life-loving. Krakow's population is swollen, notably in summer, by over eight million visitors a year on tourist or business trips. In Krakow there are slightly more women, 400,000-plus among the registered citizens, than men. The average age of the city dwellers’ is 37.5 years, with over 60 percent of the population being under 45, whereas the number of elders of 65 or more amounts to 14.9 percent. Currently the city has negative birth rate of –0.04 percent. On average a male resident of Krakow lives 73.5 years compared to 80.6 years for a female. About twenty percent of Krakow residents can boast an academic degree of MA or an equivalent, while 180,000-plus students attend the city’s 21 institutions of higher education. The unemployment rate in Krakow ranks among the lowest in Poland and it has slipped below three percent in 2007 to remain level thereafter, more or less. 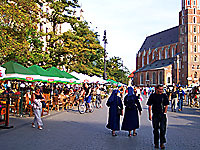 Residents of Krakow generally enjoy living in the city. The Urban Audit Perception Survey, conducted in November 2006 within the Flash-Eurobarometer project of the European Union, has found that 97 percent of the Krakow’s population are satisfied to live here. Only residents of Groningen in The Netherlands voiced such high level of satisfaction with their place /by comparison the ratio of contented citizens was 60 percent or so in Athens and Naples, nearly 80 percent in London, and some 85 percent in Lisbon – to name just few of the 75 surveyed cities in the EU, Croatia, and Turkey/. Copyright © 2001-2019 by MAREK STRZALA. All rights reserved.